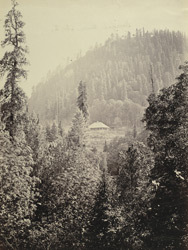 Photograph of Dungagali, a hill-station in the Hazara Distict of the North West Frontier Province, Pakistan, from the Macnabb Collection, taken in the 1860s by an unknown photographer. The Hazara District is the northernmost point of the North West Frontier Province. This is a view of Dungagali, situated on the Mukshpuri Hill, an area with many natural springs.